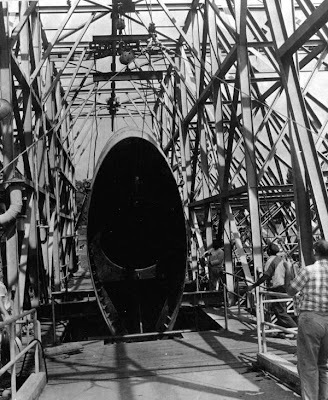 I really wanted to visit the Shell Factory in North Fort Myers to see the massive sign fronting the Tamiami Trail, a giant, golden wishbone-shaped frame with huge lettering and a monumental shell dangling beneath. 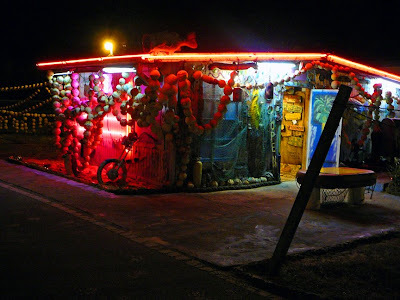 But I also wanted to see how an attraction that just sold shells thrived in today's tourism world, being far from the interstate and miles away from large population centers. Shell World's answer, besides having all sorts of gaudy and garrish shells in every configuration imaginable, is to have a little bit of everything. 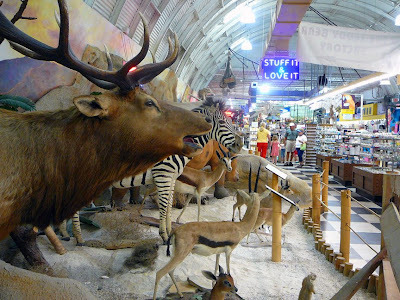 Bumper boats, a kids play area, fish ponds, a flea market, a fast food restaurant, a seafood restaurant, putt putt golf, a nature park and petting zoo, an arcade, stuffed wildlife and a waltzing waters display every evening. Basically they've turned into a low budget theme park. Their sign is absolutely massive and the shell hanging beneath it is large but not long for this earth, being made of paper maché and looking very flimsy. We parked near the sign and walked between the fish ponds, past the bar and seafood restaurant and through another parking lot to get to the main shell shopping area. 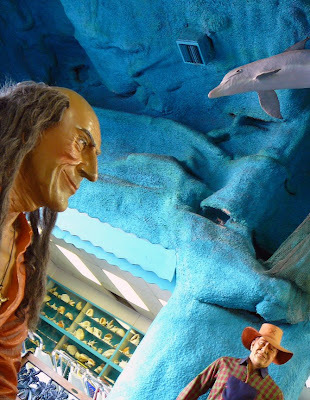 The entrance is shelltacular with a great display of rare shells and dolphins, pirates and John Wayne guarding the bright aqua entryway. 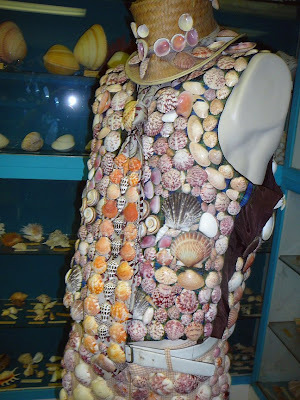 Soon you are in shell heaven or shell hell, depending on your point of view, and there is almost everything made out of shells. 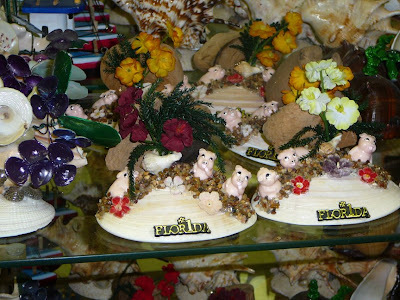 My wife's favorite were the little shell bouquets with tiny rubber pigs. 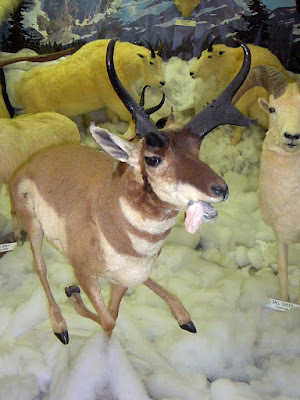 I was fascinated by the stuffed game collection, as I find these dead animals incredibly sad and haunting. 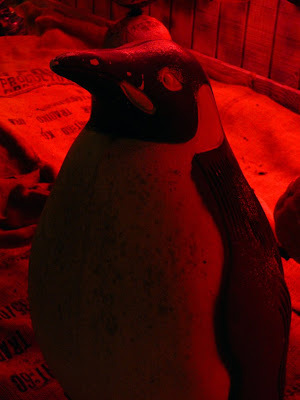 The juxtapostion of these majestic creatures in this bizarre environment was incredibly macabre. It is not for the faint-of-heart animal lover for sure. 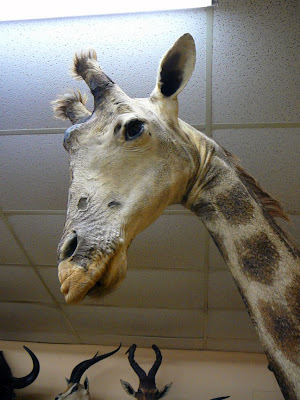 They were spread out everywhere, on top of AC ducts, suspended from the ceiling; all sorts of species including an elephant, tigers, lions, a giraffe and a hippo. Truly one of the most weirdest displays I've ever seen. Around the corner and there's a year round Christmas wonderland, including a photo-op with a life-sized Santa. Turn another corner and you're in a the standard tourist gift shop sellling towels, bathing suits and flip flops, only with a Subway restaurant and full service post office. Around another bend are large dinosaurs, 6 ft. shark's jaws, skeletons, etc. I had intended to purchase a souvenir, Florida sunshine in a can, but grew impatient as the patrons ahead of me had to have numerous shell purchases individually wrapped in newspaper. I left without spending a penny, my quota for Florida wackiness temporarily maxed out. I asked my wife what the difference between tacky and kitschy was as we drove away. Her response was "kitschy is funny and makes you feel good about humanity; tacky is sad and makes you feel bad about humanity." 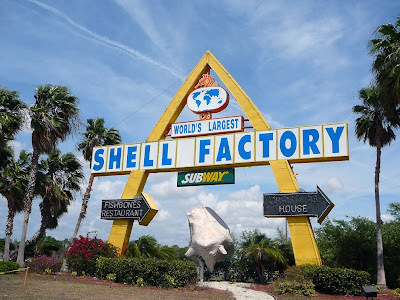 The Shell Factory is the perfect place to test your capacity for this side of Florida. The most notable interstate sight we saw as we headed south from New Tampa, was a giant Confederate flag. Sometimes I forget Florida is actually a part of the South. Other times it's right there in your face, flapping in the wind as a humongous banner reminding you of Florida's past. 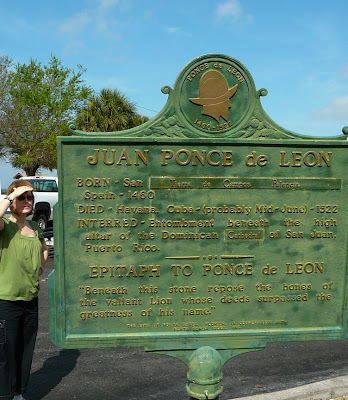 Our first stop off the interstate was to search for Ponce de Leon in Punta Gorda. This town, north of Ft. Myers, took the brunt of Hurricane Charlie five years ago. But its little downtown looked freshly painted and their bayside parks were charming. 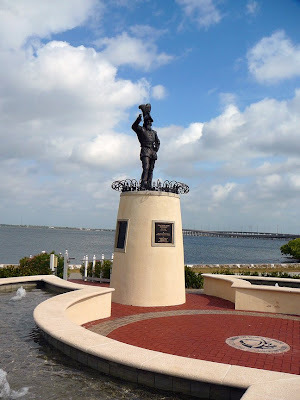 Gilchrist Park was the home of the first and most monumental Ponce Statue we encountered. Created by the Royal Order of Ponce de Leon Conquistators it is a truly royal sight, guarding the bay in a very regal manner. 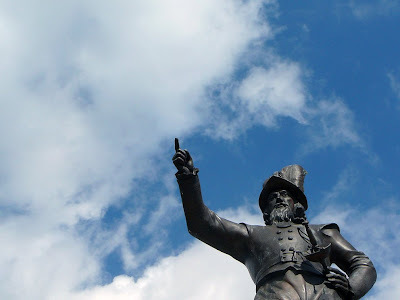 Further down the road at Ponce de Leon Park, the memory of the Spanish explorer is kept alive with three colorful statues and several historical markers. 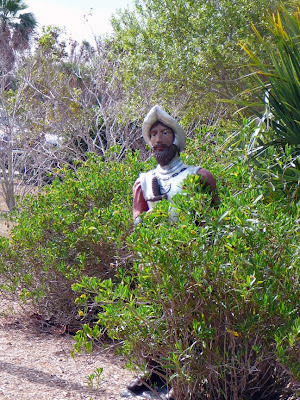 The first Ponce looks to be peering out from some bushes and is next to the historical marker for the first white man killed in America. Something tells me if they were they to re-create that marker today, they might word it a little differently. The next Ponce, just over the first Ponce’s shoulder, sits in a little stone ampitheatre. The scale is a little odd as the rockwork is far larger and makes the less-than-life-size figure look even smaller. The final Ponce is just beyond him guarding the entrance to a nature walk. The historical marker here appears to be quite old and looks to have been corrected several times. 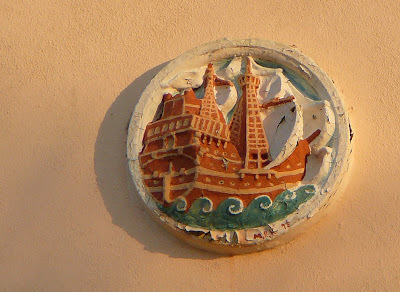 We came across one more reference to Florida’s European discoverer in Ft. Myers. 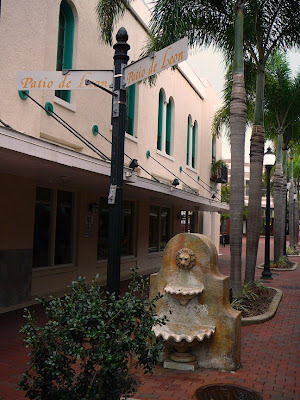 Located downtown is Patio de Leon, a European style plaza and survivor of many renovations through the years. This interesting yet somewhat quiet space in Ft. Myers’ charming downtown, had a closed hookah bar and several other newly remodeled restaurant spaces for rent. 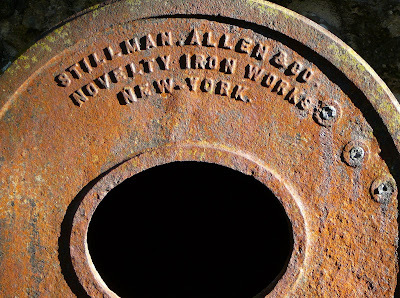 It served as a reminder that even as Florida nods to its past, it can't escape the circumstances of the present. Or maybe vice-versa. Okay, so I'm a hypocrite. I love the blue highways for scenery and nostalgia, but for speed and convenience, nothing beats the interstate. So my latest Florida journey started on I-4 west. 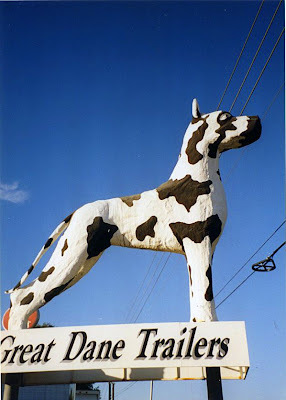 But at least there are some interesting roadside sights along the way. 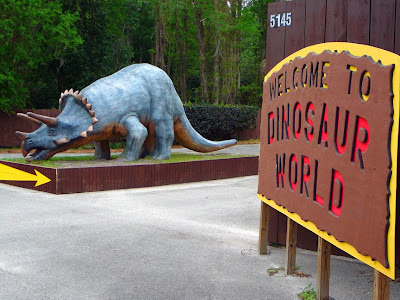 First there is Dinosaur World near Plant City. It's off the same exit as one of my favorite restaurants of all time, the Branch Ranch. One of those sprawling eating establishments that started out in someone's home and just kept growing and growing, it featured homestyle country cookin' and massive portions. To my great sadness, it closed a while back after fifty years of fillin' bellies. 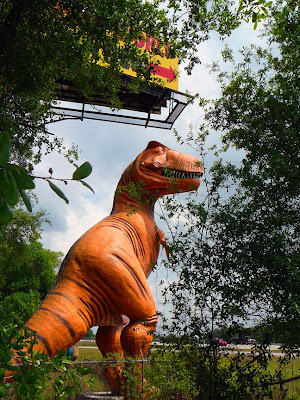 Dinosaur World, although a relatively recent roadside attraction, is in the spirit of a good old-fashion Florida tourist trap. 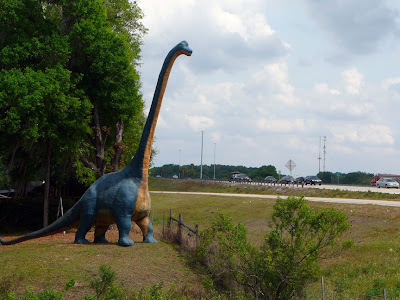 It's colorful prehistoric behemoths call the interstate traveler to stop - I've wanted to pull over every time I drove by. So I finally did, but only to take some photos near the parking lot. 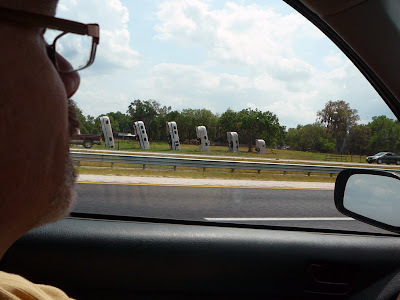 The next interesting I-4 roadside site is Florida's version of the Cadillac Ranch made of Airstream trailers. Photo by my wife, I was busy driving. Our destination was New Tampa. I never knew there was such a place as New Tampa, I guess the Tampa I'd always known is the old Tampa. In New Tampa, everything is well, new of course. It looks liked they carved some roads out of old Florida wilderness and plunked down new stuff everywhere. The wilderness has not been completely tamed as our friends who live there often have issues with wild hogs in their neighborhood. 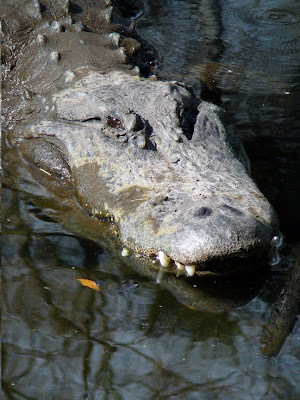 And we saw a 6 foot alligator approach the road on all fours in an attempt to cross, something I've never seen in over forty years of Florida residence. But most of New Tampa is new roads, new stores, new restaurants, new hotels. Brands everywhere. 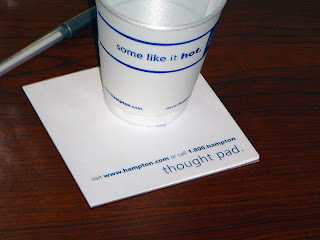 Our hotel was so branded that they had clever little taglines on every single element, including the coffee cups and notepads. Everything was new except for one very notible exception, the art gallery run by Hong Kong Willie. Nothing there is new, as everything is created from recycled materials. We saw this crazy out-of-place establishment, nestled right by I-75, and had to stop in. 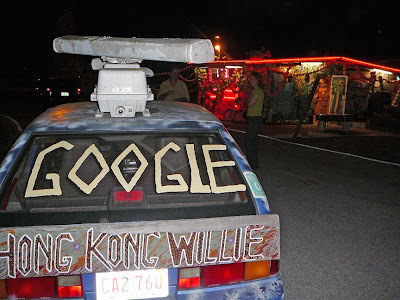 There is no signage at this outsider art environment, except the "GOOGLE HONG KONG WILLIE" painted on the back of an art car in the front. The owner of the establishment, an aged hippie named Joe, opened up the gallery for us to look around. 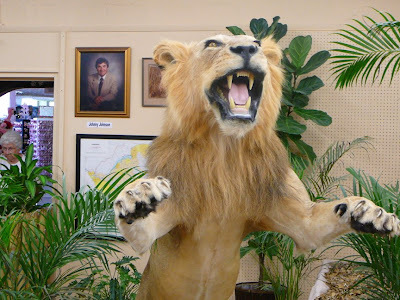 The space, a former fishing tackle store, still has fishing tackle and incredible stuffed fish amid the artwork, mostly handpainted signs, burlap tote bags and ashtrays made from old 33 records. (Note: I'd love to have shown pictures of the inside, but I was asked us not to photograph the interior- you'll have to visit his Etsy site to see the art for yourself!) Willie, aka Joe, explained that everything sold there is made of sustainable materials and showed us some of the ingredients, like coffee bags shipped from South America. 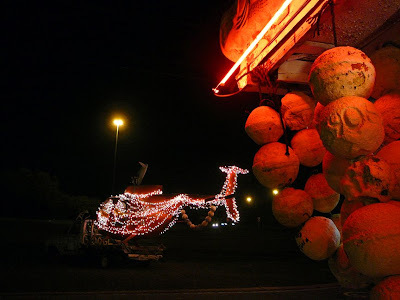 The environment alone is worth stopping for, from thousands of fishing floats, to an old helicopter, to Willie's own tribute to 911. It's obvious that these folks are working hard to keep up with the rest of New Tampa, making new stuff from old. Way to go brother. 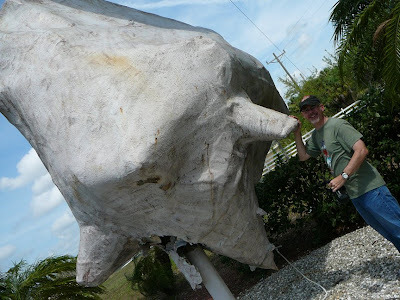 The amazing chronicler of all things roadside, Debra Jane Selzer has found two "lost" Florida roadside giants. First, the Great Dane statue that used to be located on the Orange Blossom Trail in Orlando has found a new home in Savannah, Georgia. I was always concerned that it was in dump somewhere, so I'm delighted to see it is still turning heads by the side of the road. 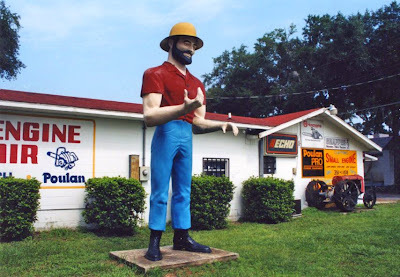 And the Muffler Man that used to be further north on 441 in Ocala is actually still a resident of the Sunshine State and has moved to Auto Air Muffler & Brake City in Tampa. 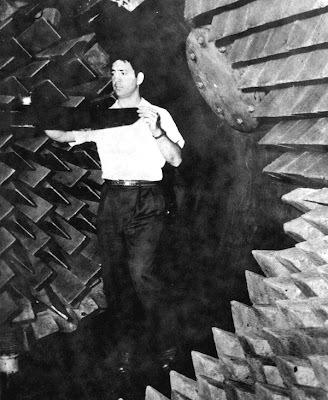 And he's ready to get to work, now holding a giant wrench. 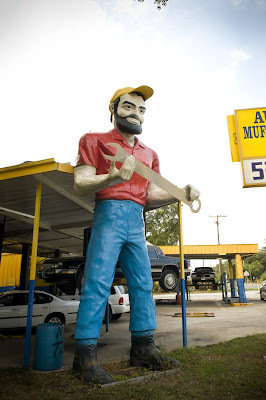 According to Wikipedia, Muffler Men were designed as twenty foot tall promotional devices to hold mufflers in their hands. 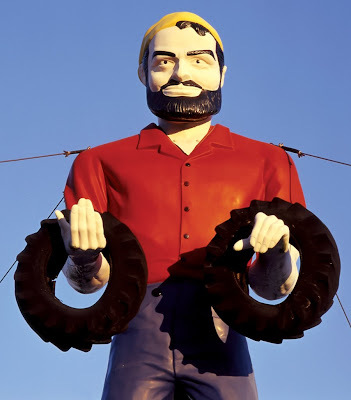 The fiberglass giants were mostly manufactured in California. 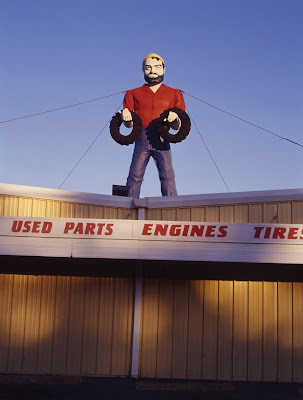 For more on Muffler Men and the many disguises they wear, consult the Muffler Men homepage on Roadside America. Here's even more on waymarking.com. Here's some more Muffler men. 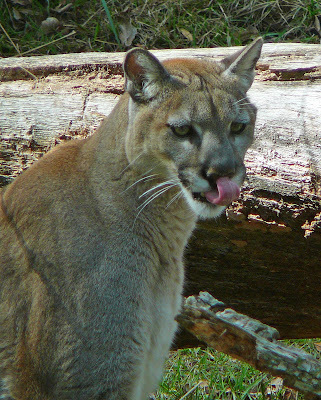 Be on the look-out for the Uniroyal Girl who used to reside on Hwy 50 in Winter Garden. Folks all across America are looking for her! 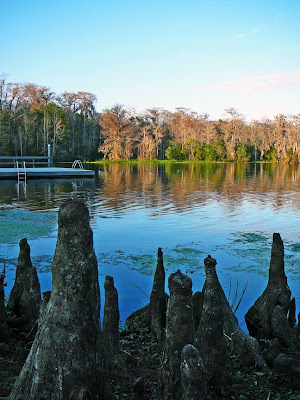 If you follow my blog, you know I'm a big fan of Florida's State Parks. 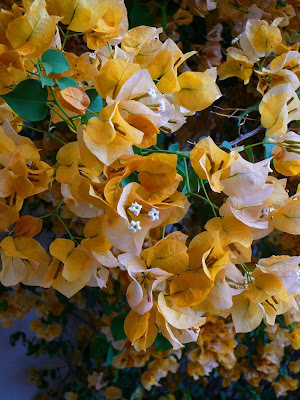 I believe they highlight and preserve Florida's unique natural and cultural resources. So I'm not surprised that I received this email today. You have graciously joined our effort to protect the parks and now we need your help!! Please call and/or email your state representative and Senator TODAY. We need to communicate our concern about closing our parks and reducing service. You can usually find their contact information on first group of pages in your telephone directory under State of Florida government offices. Following is an editorial piece I have prepared to help with talking points. Best to use your own words rather than mine. Thanks in advance for your help. This week’s news indicates significant cuts to Florida state agencies delivering services to our citizens. What has not been mentioned by the media is the proposal to close 58 state parks 2-3 days each week. On the days that these parks open, it will only be for 8 hours rather than the dawn till dusk access we now enjoy. Over 110 full-time park employees and ALL seasonal part-time employee positions are eliminated under this proposed reduction. The Florida state park system as we know it will change significantly and the entire operation for the Office of Greenways and Trails is proposed to be eliminated. Programs, services and access to our public lands will be dramatically curtailed. The park service will be lucky to be able to pay their utility bills and provide for the over 20 million people who visit our parks each year. While gloomy economic news, bailouts and greed continue to make headlines, Florida State Parks have seen record attendance over the past 3 months. This is proof positive that Florida’s families NEED these parks in order to participate in healthy outdoors activities during times of stress. 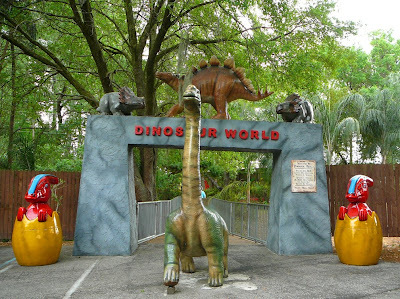 A family of 4 can visit a park for an entire day for a $5 per carload entry fee. They can even bring along Grandma and Grandpa. 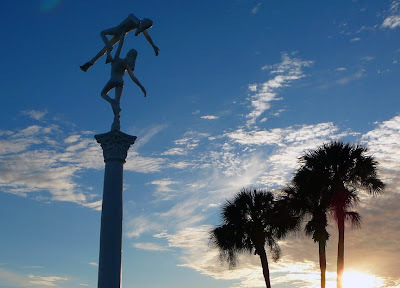 While visiting their favorite state park, Florida’s citizens can enjoy swimming, hiking, biking, picnicking and nature study, or just spend time reconnecting with each other. Contrast this with the typical $28 cost of a 2 hour movie for just Mom, Dad and the kids. Our park system is one of the most efficient in the nation. It is the ONLY State Park system that has twice achieved the National Gold Medal award. Our 160 parks involve management of over 700,000 acres of public land including 3400 campsites, 230 cabins, over 100 miles of beach and 14,000 education and cultural programs are provided for Florida citizens. Florida State Parks already generate over 54% of their operating budget through entry, camping and concession fees. Many of these fees are paid by out of state visitors. Florida State Parks budget represents less than 0.1% of Florida’s overall state expenditures. Florida State Parks generate over 1 billion dollars in direct economic impact and produced $70 million dollars in sales tax revenue while supporting over 20,000 private sector jobs – green economy jobs for nature based outfitters, concessionaires and all the support services that visitors use when traveling in our state. Over 6,000 volunteers contributed well over one million hours of free service to the park system in 2007. Individual parks enjoy the support of over 80 citizen support organizations that are passionate about their park and prove it through contribution of their time and energy. If you are as concerned about the proposed changes to our award winning state parks as we are, please call, write or email your local legislators and tell them to protect our public open space and outdoor recreation. Visit our website to learn more about the Friends of Florida State Parks and how you can become involved in saving Florida’s state parks for our children and grandchildren." I urge you to do what you can to help preserve our parks as a legacy for future generations. Here are some pictures from my visits I've taken to a few of our State Parks the last few months. I'd love to keep capturing more images and creating more memories like this in the future! 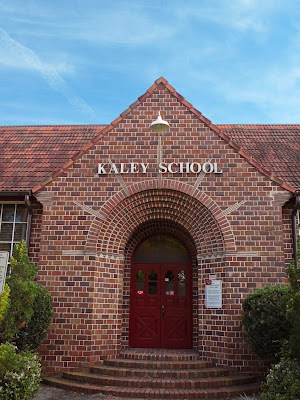 I travel down Gatlin Avenue at least once or twice a week past historical markers and a whole lot of Central Florida History. 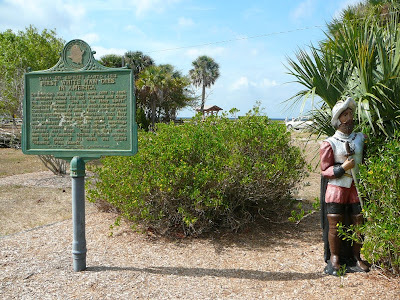 It's hard to imagine a time when that area was the middle of the battle between Florida's settlers and rogue Indians, but that's where it happened. 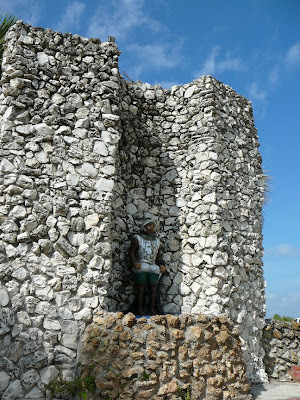 According to an article by former History Center Curator of Education Bob Beatty, the Seminole Indians were a mixture of Creek Indians from Alabama, various native tribes from Florida and runaway slaves. In 1830 the US government tried to send all the Seminoles west of the Mississippi and return the runaway slaves to their previous owners. Those issues led to the beginning of the 2nd Seminole War in 1835 when Seminoles ambushed Major Francis Dade west of Orlando. 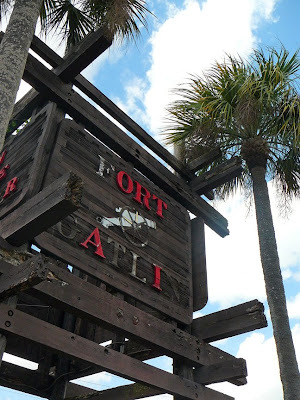 General Zachary Taylor commanded that forts be created throughout Central Florida, including Fort Gatlin, named after an Army Assistant Surgeon who was killed in the Dade Massacre. 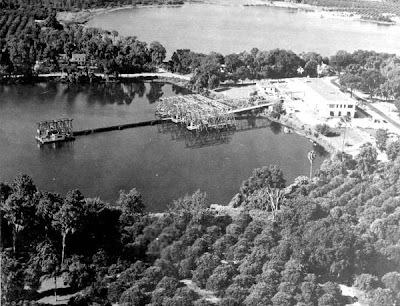 Fort Gatlin was created at a strategic point overlooking three Orlando lakes: Lake Gem Mary, Lake Jennie Jewel and Lake Gatlin. The area was known to have been frequented by Seminole leaders King Phillip and his son Coachoochee. 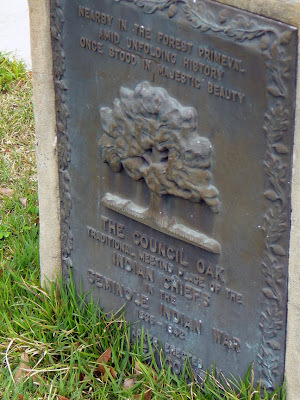 Nearby on Ferncreek, a marker points out the location of the Council Oak, the spot where the Seminole chiefs held their meetings. 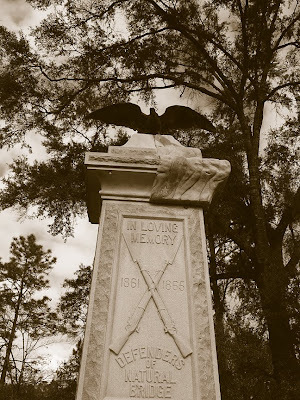 In Flashbacks The Story of Central Florida's Past authors Jim Robison and Mark Andrews describe the fort this way: "eighty feet square with two two-story blockhouses at diagonal corners, the stockades were made of 18-foot pine logs with sharpened points at the top." 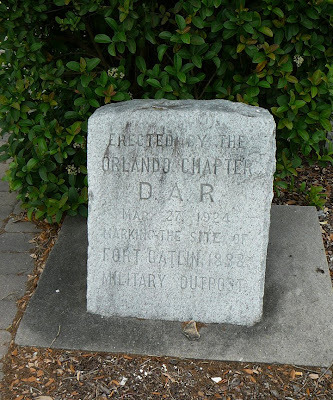 The Army withdrew in 1849 leaving some soldiers and their families in the area, who later formed the County seat of Orange County and re-named the town Orlando. 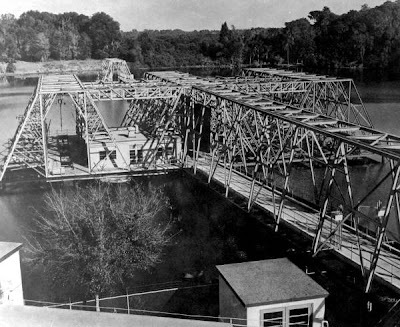 The site of the Fort was again utilized by the government when the Navy created the Underwater Sound Reference Laboratory during WWII to take advantage of the great depth of Lake Gem Mary. 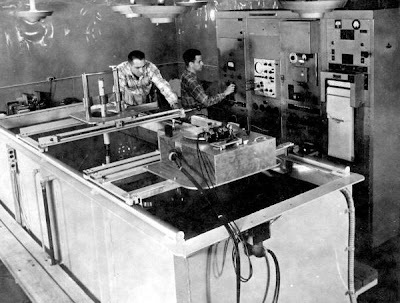 This mysterious lab closed in 1997 and the building is now used by Orange County Public Schools and the huge structure that loomed over the lake has been dismantled. 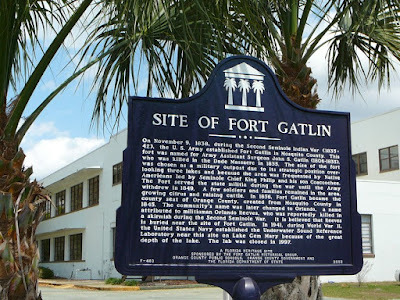 In addition to the historical markers, the legacy of Ft. Gatlin lives on in several ways. 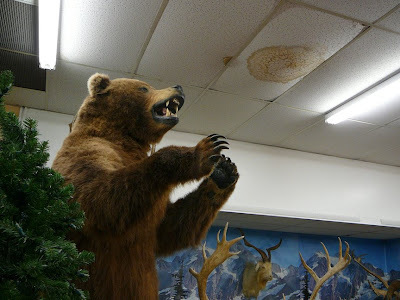 Gatlin Avenue bears the name, as well as the the Fort Gatlin Shopping Center and their fort-like sign. 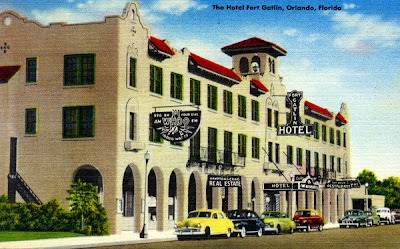 An icon of the the early twentieth century in Orlando was the Hotel Fort Gatlin on the downtown site now occupied by the Orlando Sentinel. The Hotel had a radio station, a AAA office and, to come full circle, a dining room with murals painted by Orlando's very own Joy Postle.